However calm and well-adjusted a pet is, there are some situations that most cats and dogs find stressful. Sound Preparation CDs may be the way forward. Fireworks night sends thousands of pets running for cover every year. While other animals find small children, crowds and loud noises terrifying. Though owners can comfort and calm their animals when they become anxious. The best way to alleviate fear and overcome anxiety is to gradually get animals used to unfamiliar sounds and stressful situations. One of the most effective ways to do this is to use a sound preparation CD. Specially created to help cats and dogs get used to unfamiliar situations, these carefully crafted soundtracks could help your pet put their fears behind them. It’s not surprising that loud bangs are scary for cats and dogs. Even pets who have lived through many a fireworks night often still find them terrifying, while for puppies and kittens, the event can be truly bewildering. If your pets are anxious around fireworks night, you can use a Fireworks Preparation CD to gradually get them accustomed to these nerve-wracking sounds. Play the dog sound CD to puppies to help prevent a fear of fireworks from developing, or play it to older dogs to help ease their anxiety. The CD features recordings of a real life fireworks display, ensuring the noises the dog hears are truly authentic. If animals have grown up in an adult only household, they may well become startled by the shouts, cries and tantrums of small children. Though it’s difficult to prepare animals for the poking, prodding and constant attention they’ll get from small children. You can help them adjust to the sound of babies and toddlers by using a specially created sound preparation CDs. Dog shows can be overwhelming for some animals, especially if it’s their first event. Use a sound preparation CDs to help prepare your dog for the noises they can expect to hear at a show. 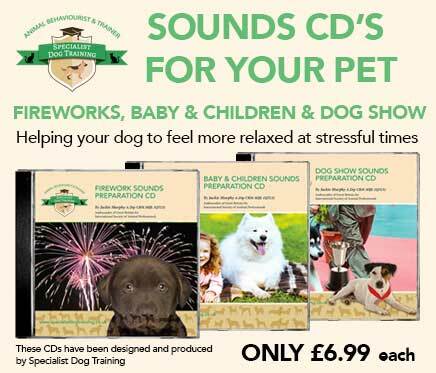 Just like the fireworks and children and babies CDs, a dog show sound preparation CD uses common noises you’d find at a dog show. Including: tannoys, barking and music, to help get puppies used to the noises they’ll hear at the event. By gradually introducing these sound preparation CDs, and by ensuring your pet always feels safe when the CD is playing. You can slowly alleviate common fears and help your pet to feel calmer and more confident. Introduce these CDs when your pet is young, and you may help to prevent these common fears from developing altogether. To find out more about sound preparation CDs, or if you’re interested in dog training and behavioural therapy, explore our site today. Check out our own specially created sound preparation CDs.